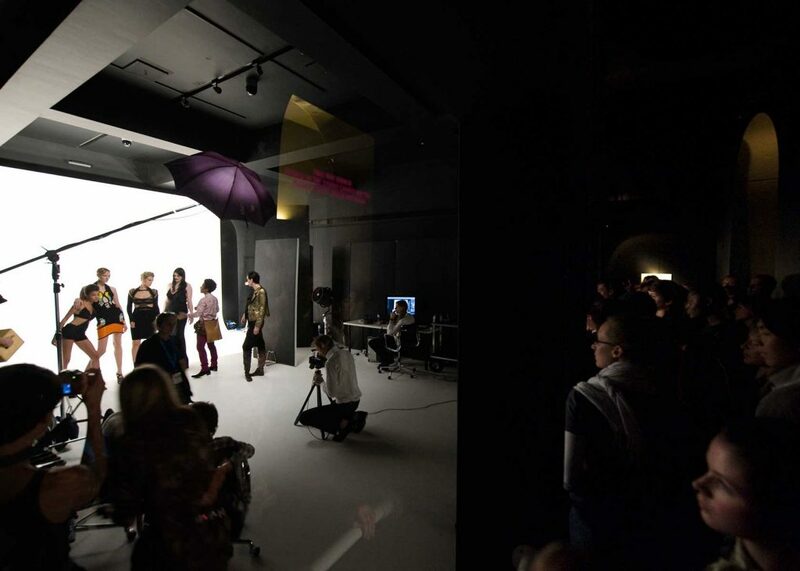 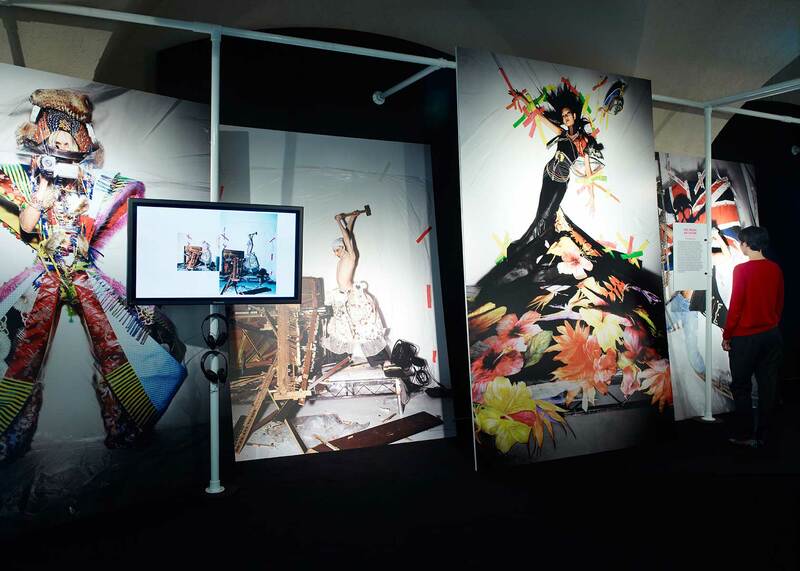 Brief: to create a physical installation for a digital initiative – photographer Nick Knights’s online fashion, film and art project, SHOWstudio. 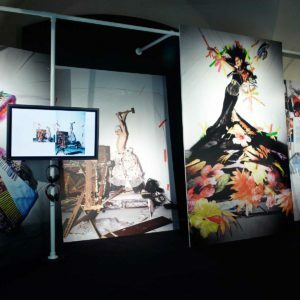 The exhibition, showcasing nine years of innovative work, was called Fashion Revolution. 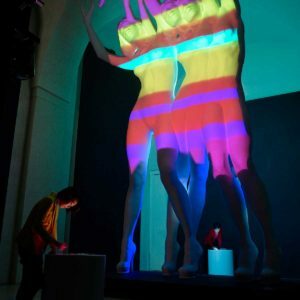 The main challenge in this brief was to make what were originally two-dimensional, ephemeral visual experiences into an engaging, choreographed physical experience. 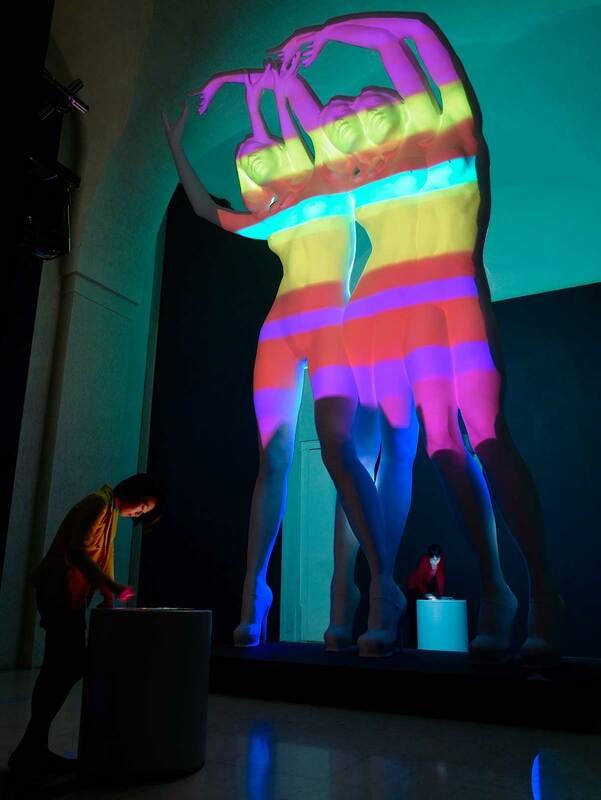 As part of a team including curators, artists, specially commissioned audio-visual and graphic designers and set and costume-makers, we worked to build an engaging, interactive 3-dimensional landscape, hoping to give scale and theatrical impact to content made up of a mix of new and historic projects and events – much represented only by a virtual archive of film footage, stills and video transcripts. 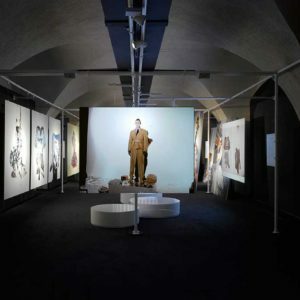 The historic Embankment galleries of Somerset House presented a unique space for the exhibition, narrow and extremely long with a vaulted stone ceiling. 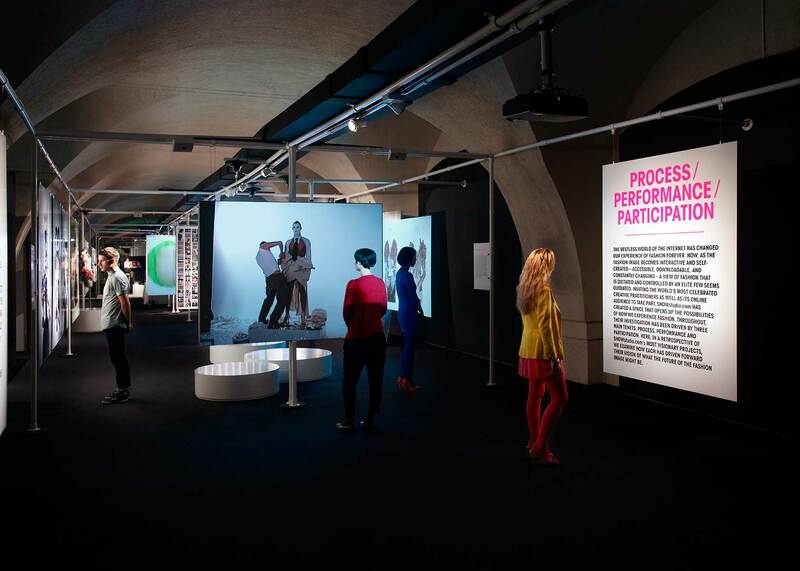 The fact that we could not fix into the floor, stone walls or ceiling and that there was no infrastructure for exhibition lighting or power, gave rise to our distinctive design solution – a freestanding, legible framework, composed of brilliant white minimalist armatures and display panels – which served to physically connect all installations while creating a clear visual separation between the exhibition interactives and their historical context. 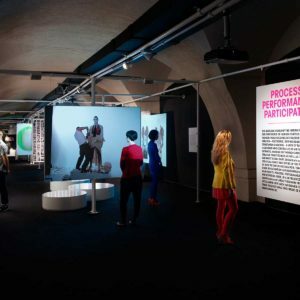 The strong language of this grid structure introduced visual continuity across the diverse works, while also carrying services to the necessary areas. 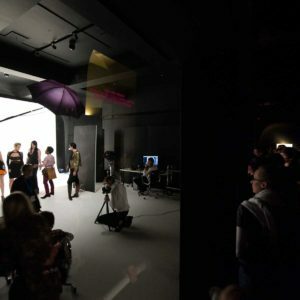 The open nature of our geometric display structure, allowed the visitor to experience content in a fluid, unrestricted manner, as one would online, as well as flexing and changing to articulate a range self contained spaces such as walk-in chambers and video and sound booths where projections and media content help transport the visitor into the virtual world of SHOWstudio. 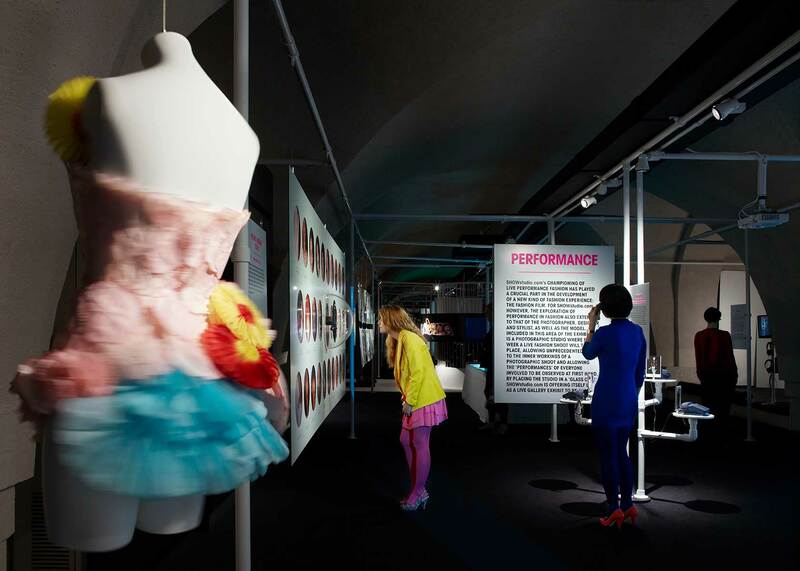 Along with original garments, cinematic experiences and kinetic mannequins, playful, imaginative interactives were a key element of the exhibition. 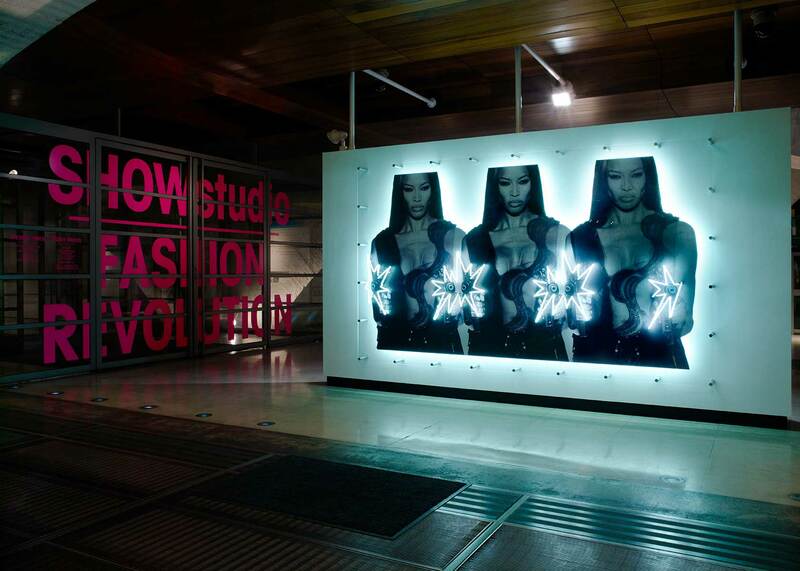 For example, a 23-foot interactive sculpture of Naomi Campbell called ’Statuesque’ which was housed in a double height room covered entirely in mirror where visitors were invited to paint via web kiosk and digital projection creating patterns, designs and statements that were then projected live onto the sculpture.